While our kids were growing up, we were avid tent campers with all kinds of terrific equipment. We also looked down on the wimpy RV campers. Who needed a trailer or a camper when they could haul a tent (and tons of extra stuff) anywhere they wanted? Our minds were changed two years ago when we rented a 26 foot trailer with our oldest son and his family to give RVing a test run. The rain poured in Yellowstone that year but we were warm and dry in our RV. 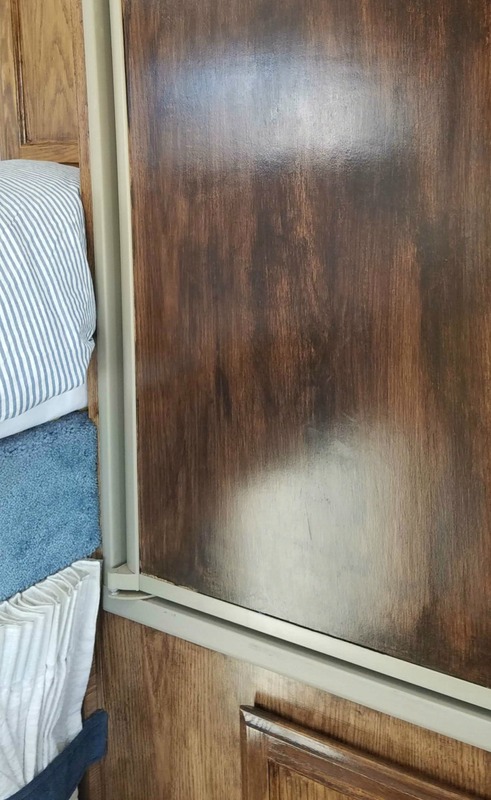 Our son purchased a travel trailer two weeks after that trip. 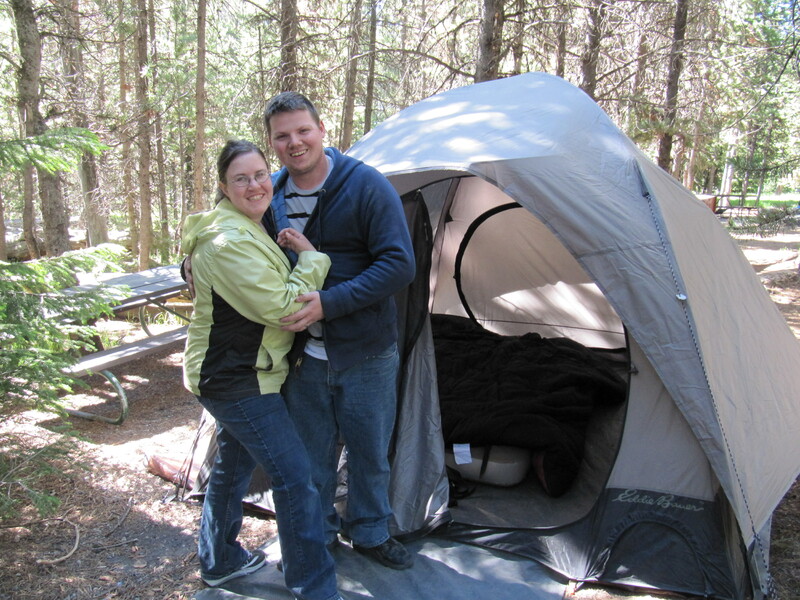 Our daughter and son-in-law, following the tent camping tradition. During that same Yellowstone trip, we watched a nearby camper offload his truck camper and sight-see in his truck. That got me thinking about a truck camper. Don often pulls his bass boat when we go camping, which made the addition of an RV feel like a lot of trailer management. But a camper would keep things compact and simple. Once we were home, I poured through local classifieds until I found a 1997 Lance Squire 850 for $3500. A few hours later we were climbing into the camper to look around. We asked a few questions, handed over the money and then wondered how to get it home. I shudder now to think of how naive we were. Believe me, the next time I buy an RV, my question list will be three pages long! 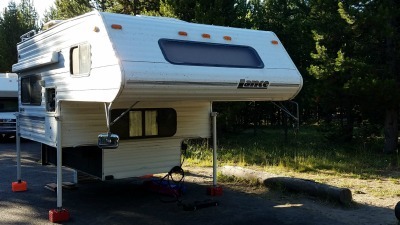 Camper successfully offloaded in Yellowstone. Notice the opening on the side? Yes, we forgot to lock down the fridge cover and it blew away. One more thing to learn! Don picked up the camper the next day. 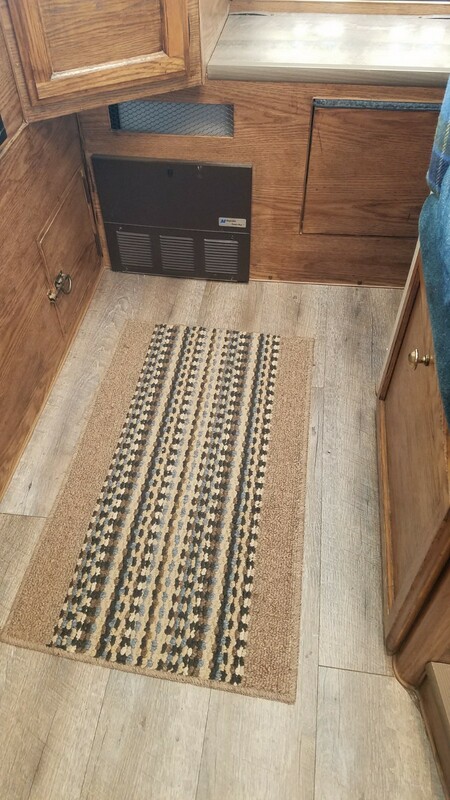 Thankfully, the seller helped him load the camper on the truck. That's when we learned about camper jacks, stabilization bars, tie downs and for the first time, wondered whether our truck could handle the load! Luckily, it could. The next summer, we offloaded the camper in our space in Yellowstone, surrounded by our kids in their giant RVs and all was right with the world. 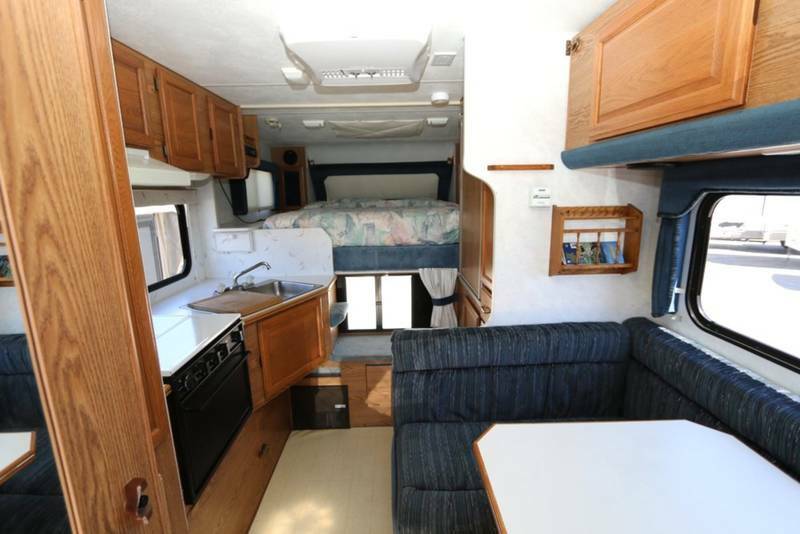 We were snug as bugs in our perfectly preserved 1997 Lance camper. Out of date, but still functional with a lot of camping left in it. That's when I started thinking. 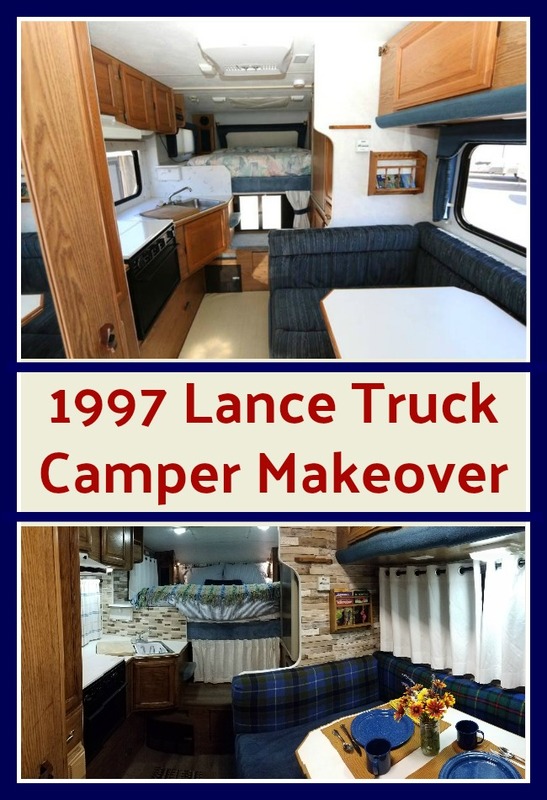 . .
How hard could it be to makeover our camper? Wouldn't it be fun if it looked like a rustic cabin? Wood walls, wood floors, simple curtains, cabin type bedding . . it started to take shape in my mind. 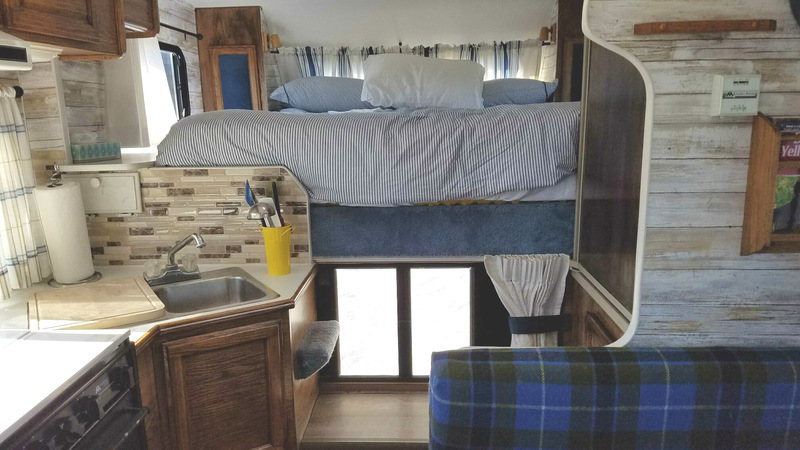 For the next 10 months I poured through RV makeovers, cabin interiors, and anything I could find related to truck camper makeovers. 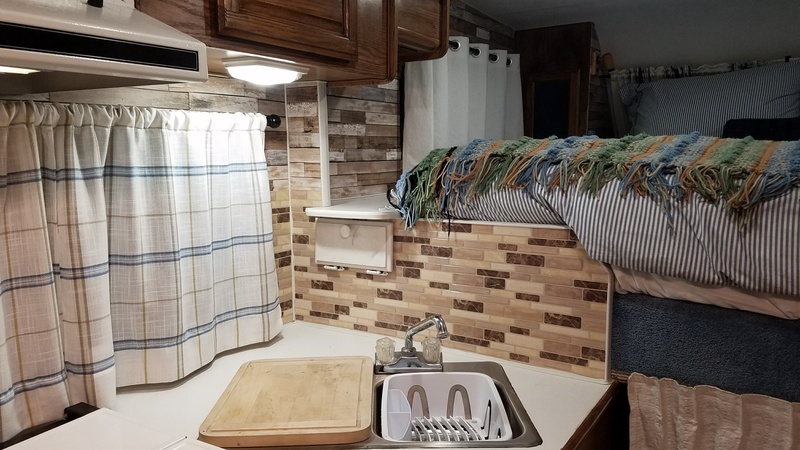 As it turned out, there is very little to be found about truck camper makeovers. 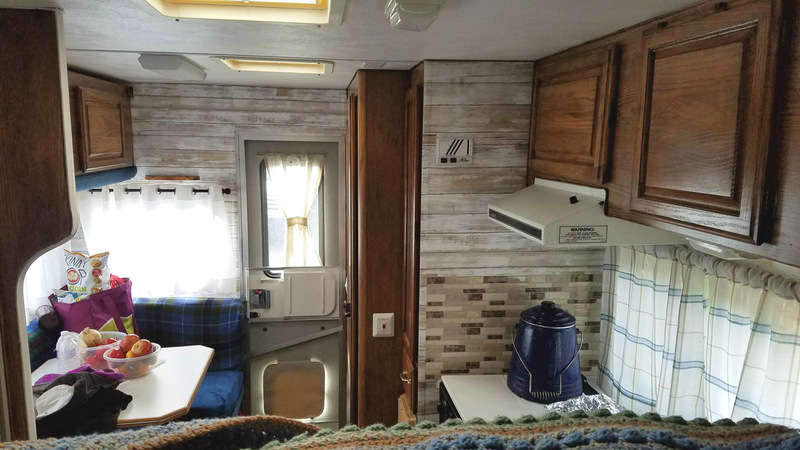 So, armed with some general RV makeover information and a rough idea, I put together a plan and searched for supplies. I started work on the project the week before we left for Yellowstone. I needed almost every hour of that week, including the nights. If you tackle a project like this, give yourself plenty of time - more than a week! 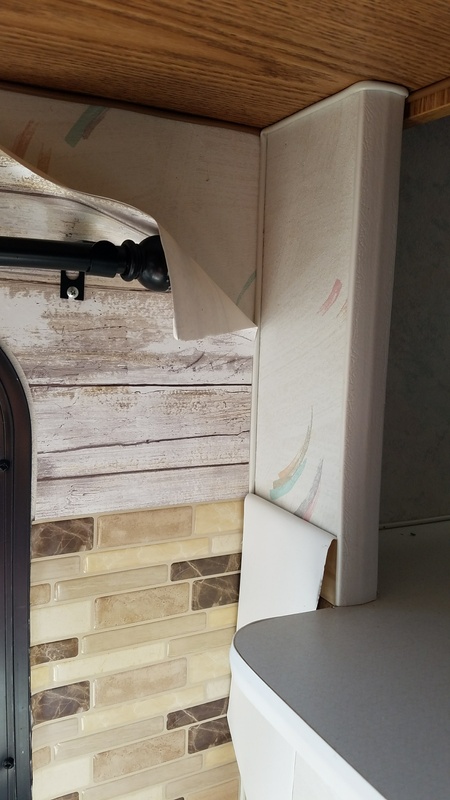 First, I removed the window coverings, which were covered cornice boards with blinds attached. 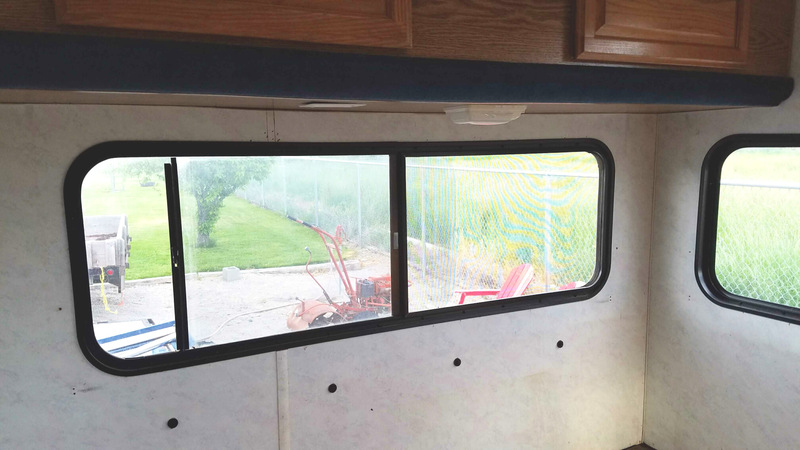 I was amazed at how much larger and lighter the camper looked when they were removed. Next I washed all the surfaces to prep them. To change the orange hued oak cabinets and paper covered walls I tried gel stain. It didn't make a big change, but it did knock down the orange hue. Using it on the wood-look paper covered walls was a bit tricky, but the resulting uneven look was OK too. It just looked more rustic. From orange oak to blotchy brown - it works! 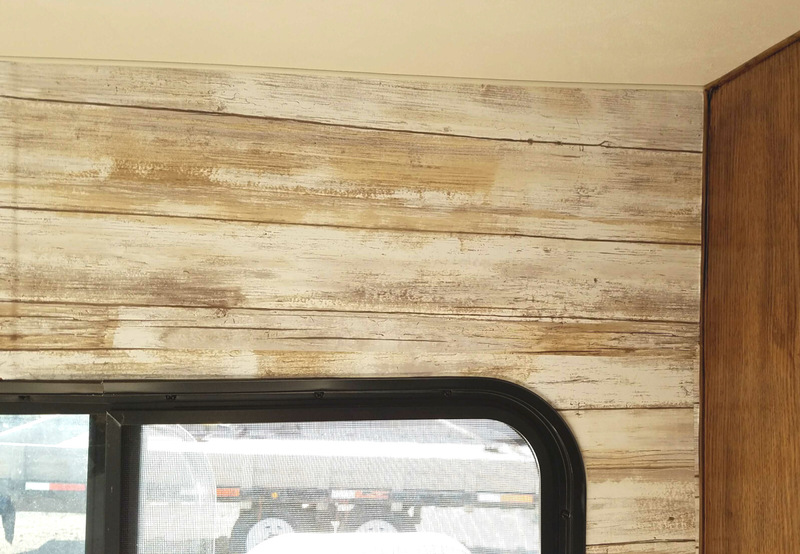 I found a terrific peel and stick wallpaper at Walmart that looked like white-washed wood planks. and gave me the cabin look while keeping the walls light. It's fairly easy to install, but don't let it stick to itself! It's a bear to pull apart. It's really easy to patch in pieces because they just blend in. I added peel and stick tile squares from Amazon to the kitchen area. 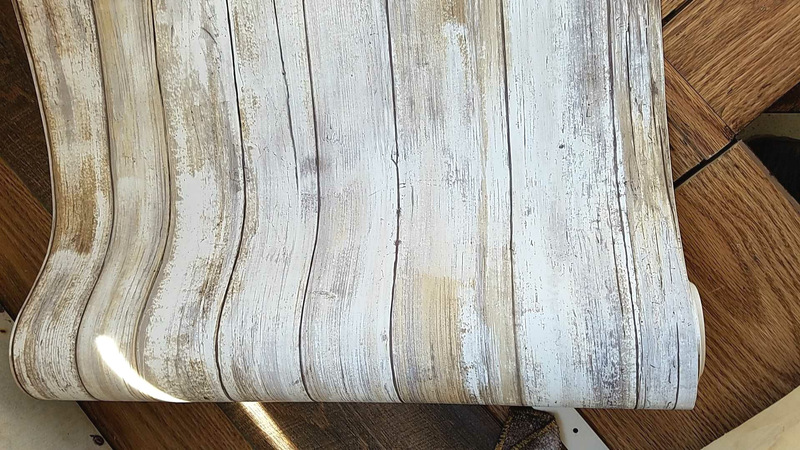 Whitewashed wood wall paper - looks great. First piece installed. I loved it! Peel and stick tile - easy to install! 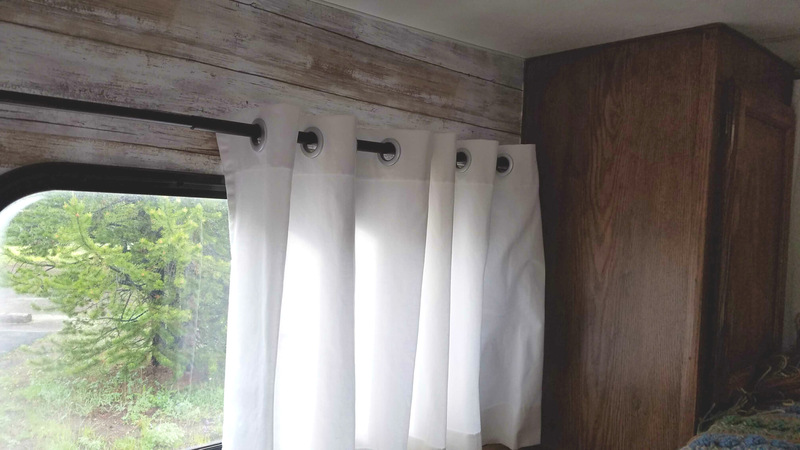 The curtains are made from white Sanela drapes from Ikea that I cut to length, hemmed and added grommets from JoAnn Fabrics. These were great! They are heavy, light blocking and private. They also open and close easily. I installed new rods from Walmart. 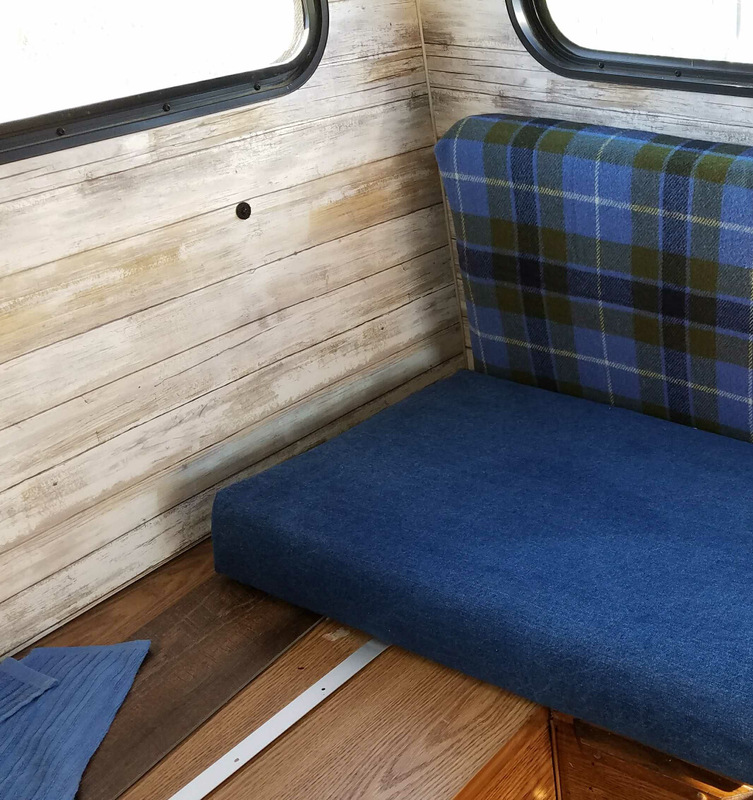 I was stuck on the seat cushions until I remembered old wool plaid stadium blankets that had been in Don's family for 50 years and were buried in my married son's closet. I loved that they didn't match. 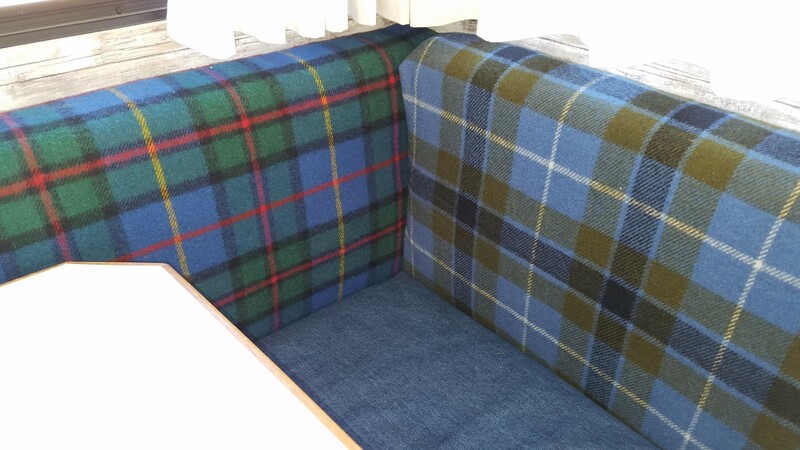 Heavy denim was used for the bottom cushions because it is durable and washable. The covers were made using very simple techniques and closed with velcro. I pulled the new covers on over the old covers. Wool and denim - can't go wrong! Mismatched covers add to the cabin feel. The bedding was easy - a down comforter covered in a blue ticking from Ikea and an old afghan for weight. 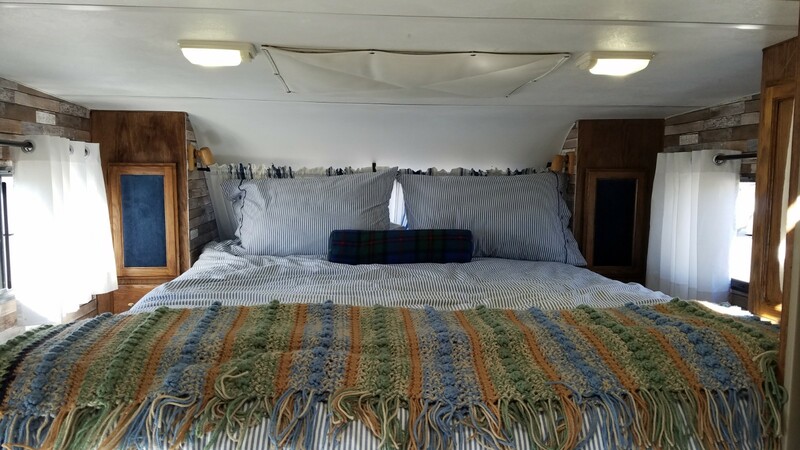 We upgraded the bed by adding a 4' foam pad to the original queen mattress. The bed is very comfortable and warm. I finished off the project with peel and stick wood vinyl planks. New floor - so easy to care for! 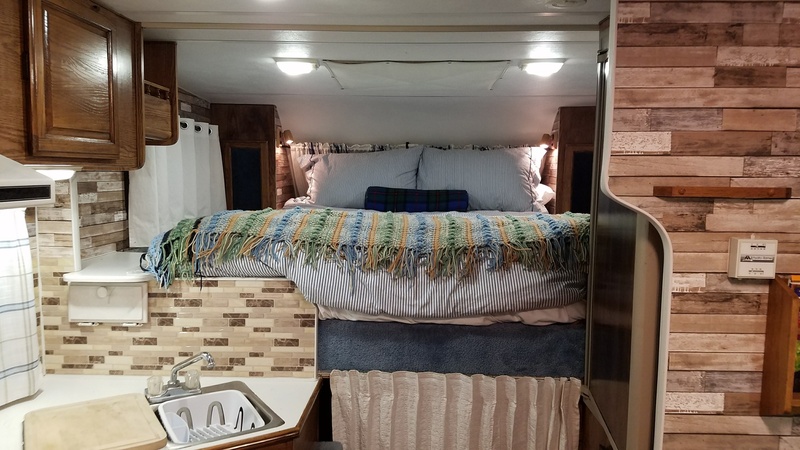 A few extra touches like appropriate reading material, LED lights, new towels and other odds and ends completed the project. I loved the finished project. 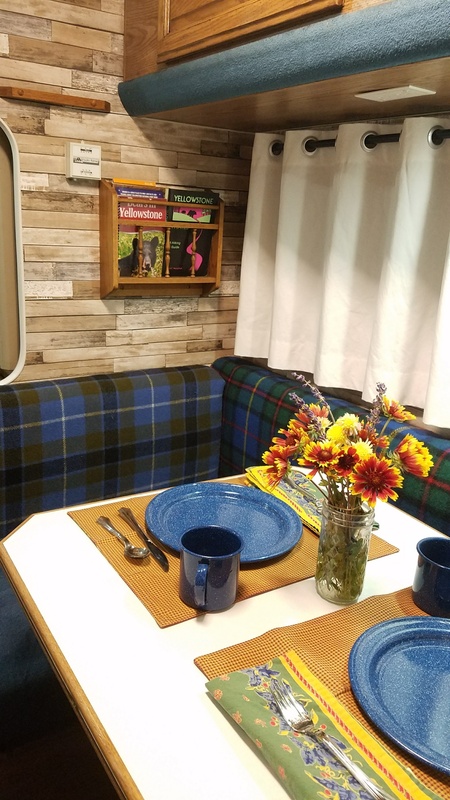 It's light, homey and rustic and completely unexpected for the interior of a 20 year old camper. Camping in 'rustic cabin' camper. The End - almost . . . While we were in Yellowstone, literally days from completion, the wall paper started to peel off. First it was in a corner here or there. I would rub it back in place and it would stay for a day or two, but eventually peel off again. Within three months, it was all peeling, shrinking and bubbling in spite of the various adhesives I tried to keep it in place. Eventually, I had to peel it all off and start again. 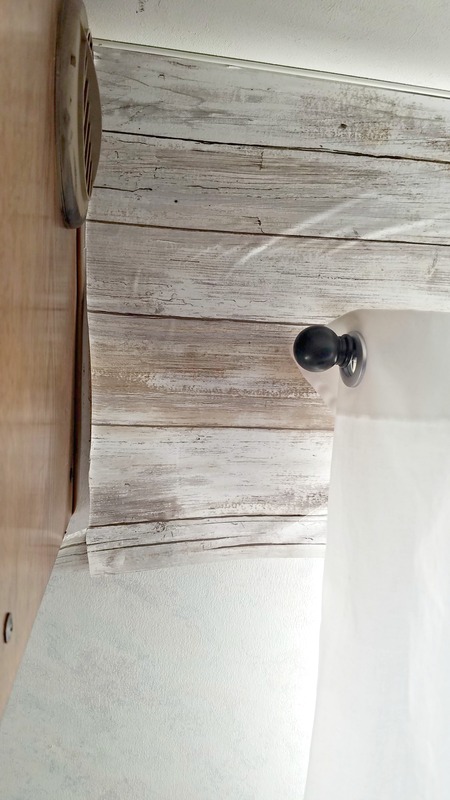 For the repeat, I found a wood plank wall paper on Amazon that required wall paper paste. After peeling off all the old paper, which also meant removing curtain rods and taking out the cushions and other things in the way, I washed all the walls using TSP, Mr. Clean sponges and scrubbing pads to make sure they were very clean. New wall paper. Still rustic! Not as great with kitchen tile, but . . . it won't peel off! The new wall paper went on over paste applied with a chip brush. Once again I found the pattern very forgiving. Though darker than the original, it's still fairly light and keeps with the rustic cabin theme. It doesn't go as well with the kitchen tile, it was less expensive than the peel and stick. Sadly, I'm out the $100 I paid Walmart for the peel and stick wallpaper. Apparently without the original packaging, I can't ask for a refund. Buyer beware! But, hopefully, there won't be a third time. 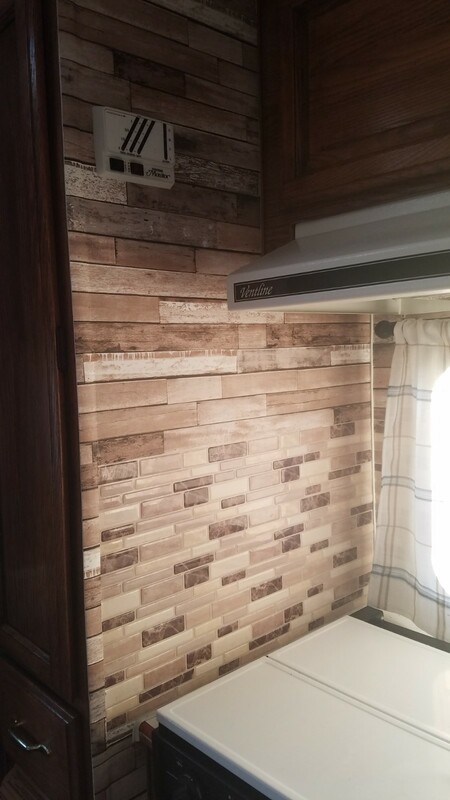 The entire project cost less than $500, even with the repeat wall paper purchase. The finished project is charming and delightful. 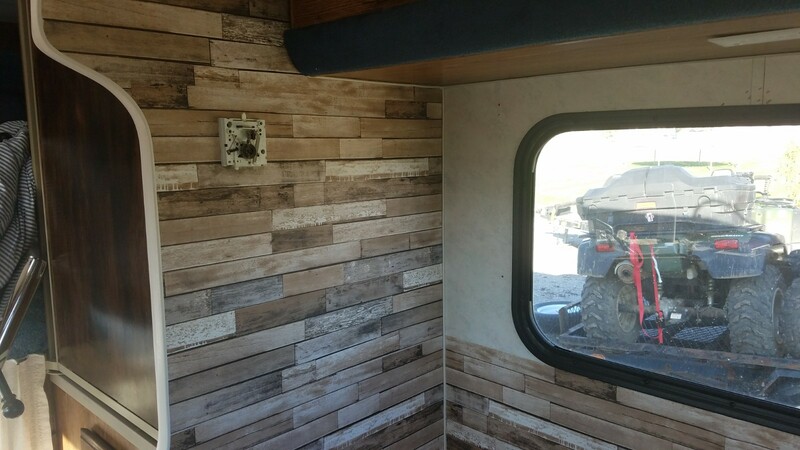 It's just fun to hang out in our little rustic cabin on wheels. The finished project. So fun to camp in and so worth the effort! 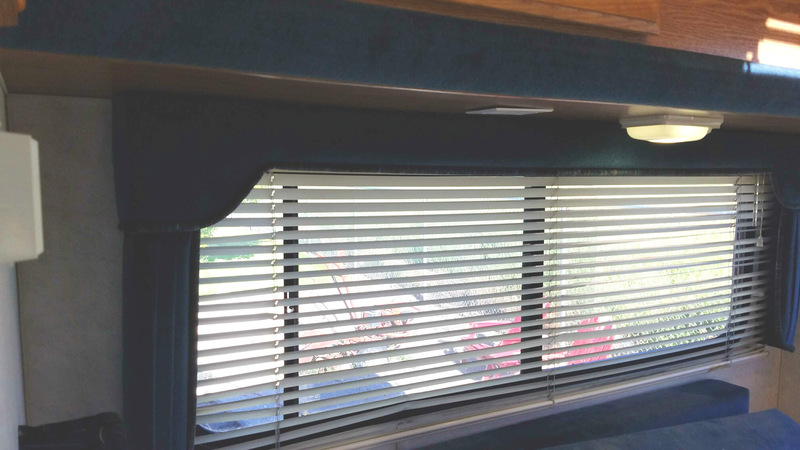 Are you thinking about an RV makeover? Please feel free to contact me for resources or with questions. And, if you like what you've read, sign up for my email newsletter to get more tips on home buying, makeovers, and trends.